Imagine camping in the deep woods. You’d want a tent with mesh that prevents bugs – even those as small as gnats – from entering into your wildlife hangout. 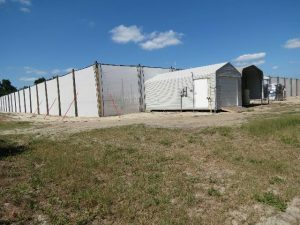 That’s the idea behind citrus under protective screens, or CUPS, which helps keep away a pinhead-sized insect that causes citrus greening, University of Florida/Institute of Food and Agricultural Sciences (UF/IFAS) scientists say. Citrus greening threatens to destroy the state’s multibillion-a-year citrus industry, according to UF/IFAS researchers. CUPS is not brand new. Three Florida growers are operating 50 acres of commercial CUPS, said Arnold Schumann, a UF/IFAS soil and water sciences professor at the Citrus Research and Education Center, which celebrates its 100th anniversary this year. Another 120 acres of CUPS citrus production is under construction for planting in 2018, Schumann said. The UF/IFAS CREC CUPS facility near Lake Alfred, FL. CUPS prevents the Asian citrus psyllid from reaching citrus trees and infecting them with greening, or huanglongbing (HLB), Schumann said. He co-authored a recently published Extension document that summarizes UF/IFAS research on CUPS and explains the economics of the system. The structure and mesh account for most of the $1 per square foot cost of the CUPS system, said Ariel Singerman, a UF/IFAS assistant professor of food and resource economics at CREC and a co-author of the document. Using preliminary data available from Schumann’s pilot CUPS program, UF/IFAS researchers made projections for the remaining years of the investment and found that a price of $24.15 per box of fruit results in a grower breaking even. “Given that current prices of specialty fruit are above that level, CUPS is profitable under current market conditions for growing those varieties,” Singerman said. 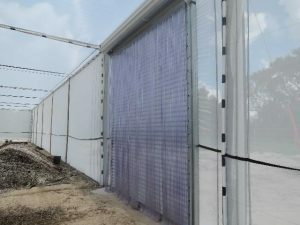 UF/IFAS researchers are working with growers to reduce the cost of screen house structures from $1 to 50 cents or less per square foot, Schumann said. They might import the screen or modify the pole-and-cable architecture to reduce the cost of materials, he said. Steel rollup door with a second plastic strip door, inside the CREC CUPS. About 90 percent of the citrus produced by Florida growers goes to make juice, while the rest, referred to by the industry as fresh citrus fruit, is consumed as food, UF/IFAS researchers say. In some states like California, fresh fruit production accounts for nearly all the consumption, Schumann said. UF/IFAS researchers and growers won’t know for certain whether citrus farmers can maintain a profit by using the screening system to keep out the psyllid for another seven to 10 years, he said. Every year that we spend researching the CUPS system rapidly improves our forecasting ability, and further refinements bring us closer to the reality of a sustainable, profitable solution, Schumann said. Many factors also play a large role in the effectiveness of CUPS, said Schumann. Those include optimizing fertigation – when growers inject fertilizers and other water-soluble products into an irrigation system. CUPS success also hinges on improved planting density to produce high, early yields and choosing varieties with the best consumer preference – for example, those that are seedless, easy peeling and with the legendary “fresh from Florida” taste. “Meanwhile, our research strives to optimize those factors affecting profitability that we can control,” Schumann said. For example, growers have little control over fruit price, he said. But by planting early-maturing varieties picked before competitors’ fruit in other regions like California, growers in the Sunshine State can get better market prices, he said.